France's President Francois Hollande is under pressure to reform its flagging economy after both the IMF and a separate government-commissioned report urged him to slash employment costs. 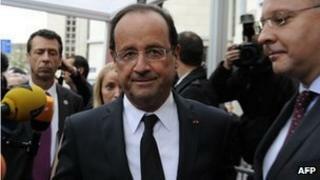 The International Monetary Fund said France must act or risk falling further behind its European peers. The former boss of aerospace group EADS, Louis Gallois, urged the government to improve competitiveness. Mr Gallois wants French payroll taxes cut by 30bn euros (£24bn) in two years. Mr Gallois was asked by President Francois Hollande to investigate what was holding France back, as part of a "competitiveness pact", looking at why the French economy has fallen behind rivals such as Germany and suggesting reforms that could help address the gap. France accounts for just 13% of eurozone exports, compared with 17% a year ago, and its unemployment rate stands at 10.2%, as against Germany's 6.9%. The report's 22 proposals include slashing the social contributions paid by employers by 20bn euros (£16bn), as well as those paid by employees by 10bn euros. To recoup some of these lost funds, the report suggests increasing VAT and making cuts to public spending. Mr Gallois also suggests the creation of a set of laws to make the creation of start-up businesses easier. Similarly, the IMF, in its annual review of the French economy, said France should ease employment laws to make it easier to both hire and fire workers, as well as cut payroll taxes to encourage employers to hire more staff. The IMF also suggested the government should make working hours more flexible, limit future rises in the minimum wage and reduce unemployment benefits during economic upturns to provide a greater incentive to look for work. "[France's] growth outlook is being overshadowed by a significant loss of competitiveness," the IMF said. Last month, the IMF cut its growth forecasts for Europe's second-largest economy to 0.1% this year and 0.4% in 2013, from 0.3% and 0.8% respectively. President Hollande, whose official response to the Gallois report is due on Tuesday, insisted he would take "tough decisions", but said his policy needed to be "holistic". The government has already made clear that it will not contemplate shifting more of the tax burden on to households when it has already drastically cut spending, in a bid to reduce its 2013 deficit to 3% of gross domestic product (GDP) from 4.5%. An indication of the report's likely reception came from Social Economy Minister Benoit Hamon. "This report is a contribution. It's the government that governs," he said.